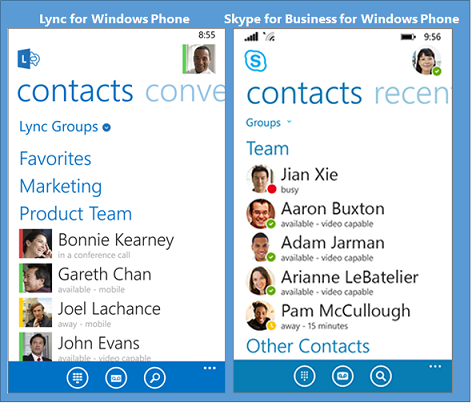 Lync for Windows Phone has become Skype for Business for Windows Phone. The change brings a fresh new look and simplified controls to all the features and functionality you already know. Skype for Business for Windows Phone includes a new look and feel, new emoticons, and other improvements. And, if your organization uses Skype for Business Server 2015, the ability to communicate with your Skype contacts using IM, audio call, and video call. We've spelled out all the details in Explore Skype for Business on mobile devices. See that article for the full story. To use Skype for Business for Windows Phone you need a Skype for Business or Lync account—typically the same user name and password you use when signing in at work or school. If you're already using the desktop version of Skype for Business, then you have a Skype for Business account. You can download the app from the Windows Phone store. See Sign in to Skype for Business on a mobile device for more information.